The Great Mortdecai Moustache Mystery - the fourth Charlie Mortdecai novel, soon to be a major film starring Johnny Depp 'Deliciously nasty ... An adventurously off-piste whodunit' Observer 'She was a Fellow and Tutor of Scone College and the world must learn that Fellows and Tutors of Scone College shall not be done to death with impunity.' The Hon. Charlie Mortdecai (and his intrepid moustache) is invited to Oxford to investigate the cruel and most definitely unusual death of a don who collided with an omnibus. Though her death appears accidental, one or two things don't add up - such as two pairs of thugs who'd been following her just before her death. 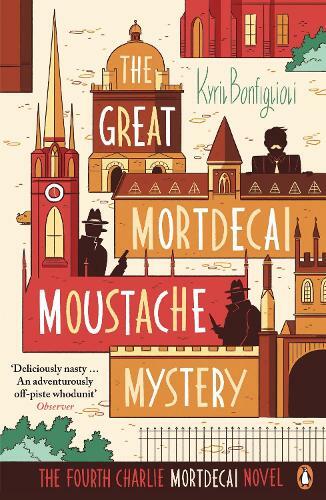 With more spies than you could shoe horn into a stretch limo and the solving of the odd murder along the way, The Great Mortdecai Moustache Mystery is a criminally comic delight. 'Gloriously, infectiously funny' Guardian 'The result of stewing together PG Wodehouse and Raymond Chandler, lightly seasoned with Ian Fleming and Damon Runyon, then adding a jigger of Groucho Marx and a dash of the Marquis de Sade' Mail on Sunday 'A delightfully black comedy thriller - and it will tell you everything you need to know about onanism in fourth-century China' Observer 'Blissfully funny' Independent Kyril Bonfiglioli was born on the south coast of England in 1928 of an English mother and Italo-Slovene father. After studying at Oxford and five years in the army, he took up a career as an art dealer, like his eccentric creation Charlie Mortdecai. He lived in Oxford, Lancashire, Ireland and Jersey, where he died in 1985. He wrote four Charlie Mortdecai novels, and a fifth historical Mortdecai novel (about a distinguished ancestor).